World Poetry Award Winner Janet Kvammen from Canada! Also Janet’s work is featured in two World Poetry Displays, one at the Britannia Public Library and at Irving K. Barber Learning Centre at UBC. 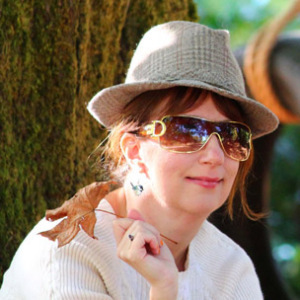 Janet Kvammen is a photographer, artist and book cover designer among other things; she is a poet of many passions who writes about her love of nature and the nature of love. Thinking she would never be published she has somehow ended up in multiple anthologies and hopes to get her own book out someday. The recipient of a Writer’s International Network 2012 Distinguished Poet and Artist Award, Janet has been a featured poet and host at various literary events including “Poetic Justice”, “Poetry in the Park”, “World Poetry” and more. A Director of the Royal City Literary Arts Society, she is also the editor/designer of their E-zine, Wordplay at work. She thrives on creativity! It is good for the soul! This entry was posted in Featured Poets, General, Ongoing World Poetry Events, World Poetry Canada International Peace festival and tagged Janet Kvammen on October 5, 2014 by Ariadne. 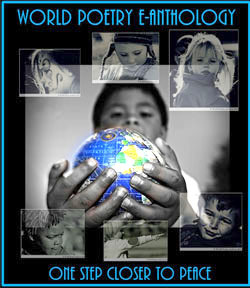 The Fourth World Poetry Canada International Peace Festival! The Fourth World Poetry Canada International Peace Festival Proudly announces the Empowered Award Winners. We had over 300 nominations come in, some even six months early. We wish we could honour all of you. Each nominee was nominated by at least two people, in some cases much more. A check was made as to background, good heart,abilities and the quest for peace. The Empowerment awards are based on these qualities. This year, the age range is from 12-100! An award will be given to those that can attend during the month of October, for those who cannot come due to Visas or other reasons, a certificate will be sent to you by e-mail. In past festivals, awards were sent out, but most never reached their destinations. If there is a name or country error, please let us know. 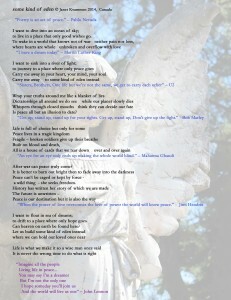 This list will be going on site and when time permits, a brief bio, photo and a poem or writing will be put on site. All the best to you and keep up the good work. Peace and the world needs you! 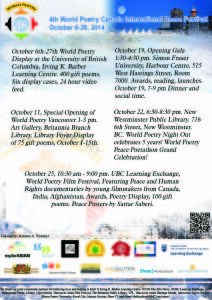 World Poetry Canada International Peace Festival Award Winners! World Poetry Lifetime Achievement Award: Carol Knepper, Canada. World Poetry Unsung Hero Award: Mobin Saberi, Canada. World Poetry Cultural Ambassador Michael Kwaku Kesse Somuah, Ghana. World Poetry Music Ambassador Yoshifumi Sakura, Japan. World Poetry Cultural Ambassador: Mutiu Olawuyi, Gambia. 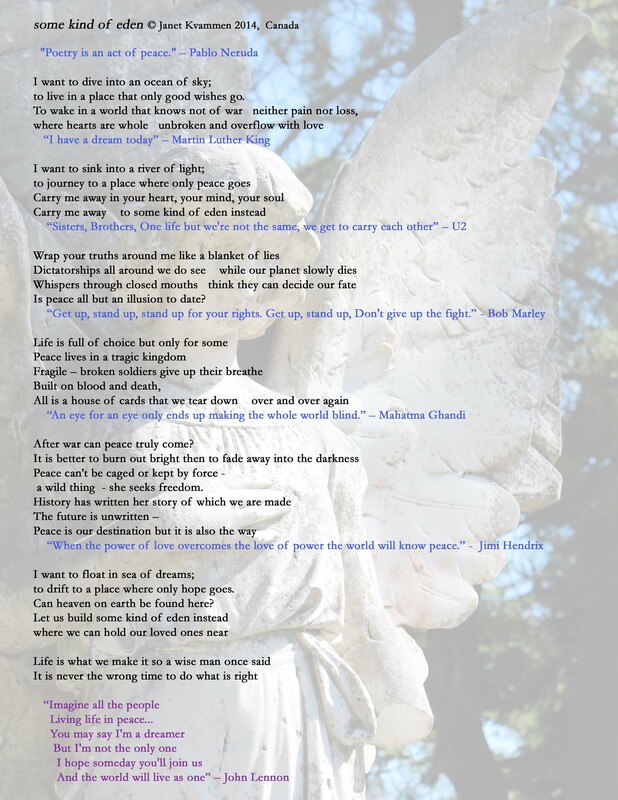 World Poetry Youth Peace Ambassador: Timileyin Olajuwon, Nigeria. Anviksha Srivastava. India & USA. This entry was posted in Ariadne's Notes, Featured Poets, World Poetry Canada International Peace festival, World Poetry Lifetime Achievment Award Past and Present Winners., World Poetry Special Events, World Poetry Youth Team and tagged Adisa AJA Andwele, Afghanistan, Akshat Ajay Sharma, Anviksha Srivastava. India & USA., Canada, Carol Knepper, Carolyn Mary Kleefeld, Elaine Woo, Ghafar Faizyar, Honey Novick, International Peace Award Ariadne Sawyer, Janet Kvammen, Kagan Goh, Lidia Chiarelli, Lini Grol, Mamta Agarwal, Mary Fowles, MICHAEL KWAKU KESSE SOMUAH, Mobin Saberi, Murray Kion. Netherlands, Mutiu Olawuyi, Rahmat Haidari, Sainabou Baldeh, Samay Hamed, Sharif Saedi, Stanley Barkan, Timileyin Olajuwon, Una Bruhns, Yoshifuma Sakura on August 10, 2014 by Ariadne.